MOTIVATED SELLER - BRING ALL OFFERS AND TRADES! This 96 Hargrave Enclosed Skylounge Motoryacht 2008 features a one-of-a-kind option - a 2 person Elevator which services all 3 levels! Gorgeous Sapele wood interior, all interior soft goods replaced 2013. Convenient Day Head. KVH TV, hydraulic bow and stern thrusters, 1400 gpd water maker. Naiad Stabilizers, underwater lights, and much more! United Yacht Sales New Jersey would love to guide you through a personal showing of this 96' Hargrave Enclosed Skylounge My 2008. 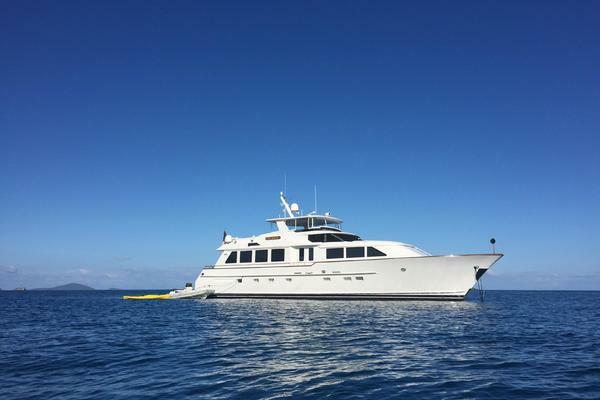 This yacht for sale is located in DANIA BEACH, Florida and priced at $3,345,000. For a showing please contact us by filling out the form on this page and we will get back to you shortly!